Paul Pearson (back row, second from the right) and a few of the family members and friends who help make Chef Paul’s Café the area’s hottest soul food restaurant. 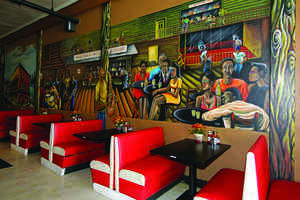 Navarro, a local homeless artist, created the mural that runs along the length of the wall in the café. It is a work in progress, with the saxophonist being the most recent addition. 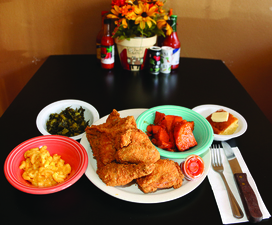 Yes, the best fried chicken in Fresno — as well as other comfort food standbys like meatloaf, greens and macaroni and cheese — is served out of a small soul food restaurant in Chinatown. Owner and chef Paul Pearson always knew he was meant to work in a profession where he served people. “When I was in grammar school, I would get up in front of the classroom and say I was going to be either a chef or a minister,” he says. Pearson chose the former and began working in area restaurants at the age of 13, first as a bus boy at Wonder Valley Dude Ranch in Pine Flat and eventually as head chef at restaurants like the old Hacienda in Fresno. In 1981 he started his own full-service catering business, which he still runs. It was the catering business that inadvertently led him to open Chef Paul’s Café, which specializes in home-style soul food, the sort families might enjoy together at a Sunday night dinner or a summer picnic. Originally, Pearson says, he had no intention of opening a restaurant. He initially acquired the space on downtown Fresno’s F Street to use for the catering business. But, he says, people kept asking him to open a restaurant in the space instead. He opened Chef Paul’s Café about three years ago but shut it down shortly thereafter, feeling that with his catering business he wasn’t able to put in the time the restaurant required. After many requests to reopen, he says, he decided to give it another go. Since reopening in April of 2014, it has garnered a loyal following. “We get calls all day Monday and Tuesday asking if we’re open,” Pearson says. The restaurant is actually closed on Mondays and Tuesdays to allow Pearson time to concentrate on his catering jobs. By the time he’s ready to open late on Wednesday mornings, people are lined up outside, waiting. He is assisted in day-to-day operations by his wife Rose (“Pinky”), whose influence extends beyond the kitchen. The large Jazz Age-inspired mural on the wall, for example, was Pinky’s idea. They hired a local homeless artist to design it and Pearson describes it as a continual work in progress, with the most recent addition being the saxophone player. That they have been able to not just run a successful restaurant in downtown Fresno, but do it solely on word-of-mouth advertising, is nothing short of remarkable. They come for his famed fried chicken, though Pearson says the braised oxtails are actually his biggest seller. 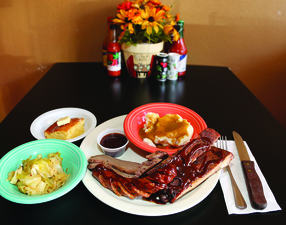 Other best sellers include fish and grits, meatloaf and ribs. He tries to anticipate the needs of his customers by taking all of these factors into consideration, whether he’s catering or planning the day’s specials at Chef Paul’s Café. 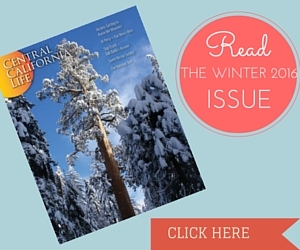 Written by Katie Fries, a Fresno native and graduate of Fresno Pacific University. 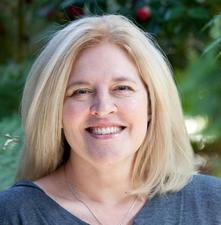 Formerly based in Chicago and the Bay Area, where she wrote and edited for several publications, she returned to Fresno in 2013, where she continues to freelance on various topics.